Just as seasons come and go, so do styles. Lately there has been a sharp shift in men's dressing style and more and more men are wearing jacket and trousers than 2 piece suit on a daily basis. Even where the suit might have previously been to formal for some, the idea of pairing jacket and trousers is casual enough in comparison but formal enough to allow peacocking of your personal flair. For customers this means we are perpetually on the lookout for new cloth bunches featuring jacketings, and trousers as separates. For trousers the options are usually easier to come by as you can still take suiting fabrics and only make the trousers. With jackets this doesn't always work. Jacketings are generally woven slightly differently than regular suits, and have less the look of a suit jacket and more the look of a cloth that requires attention to the pairing. 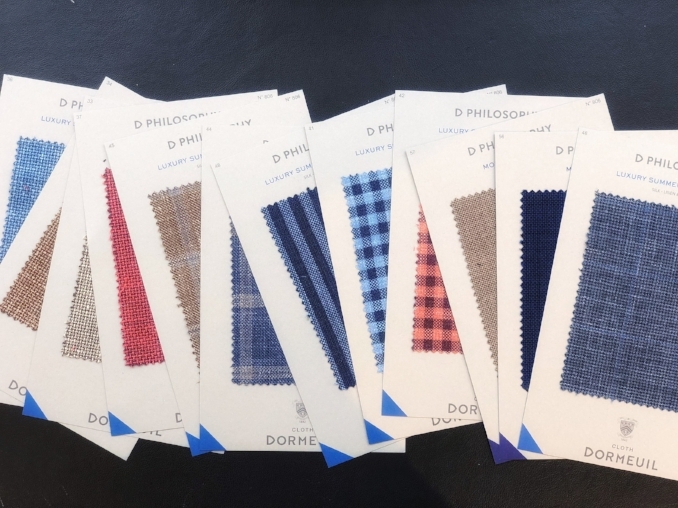 The Dormeuil D Philosophy Bunch for summer 2018 showcases stylish and trend driven cloth designs made of Wool, Linen, and Silk. They reflect the spirit of the times for softer tailoring and European summer style. At Norton & Sons we like to take cloths evoking foreign environs but construct it in a truly British Savile Technique. The marriage of stylish cloth choice and British Tailoring know-how allows you to both move with the times and also cut your own figure in a sea of soft and softer still tailored jackets. Actually the trend is so unstructured of late that it may as well be called a cardigan rather than a tailored jacket. This bunch is all exclusive to one piece per cloth pattern. Once the piece is sold out, the cloth is sold out for good!